It wasn’t easy to get out of view of the port on a flat world – – you had to get far enough out that atmospheric hazing did the job for you – but a few patches of mist helped. Come to think of it, that meant that – at least on the open sea – any ship that DID sneak up on you was almost certainly hostile. Still, thanks to some privacy-spells and some patchy fog they were likely unobserved when they got all their ships together. 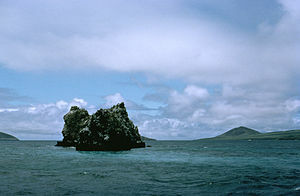 Their first destination was a tropical port far to the South called Li Cae, where they would sell their cargo of enchanted and manufactured goods and pick up various silks, gems, and rare woods and supplies for sale at another port off to the East – a part of a plantation isle called Isle Sorna. There they would pick up various foodstuffs and other plantation goods that didn’t grow very well back in the city for sale back in Cyrweld. It was a fairly simple triangular route – far from the most profitable possible route, but relatively fast, offering a solid and dependable profit, and not one the Otters could undercut thanks to some old quarrels and contacts in those ports. Hurston suspected that the most likely place for an attack was during the stretch to the plantations – although the odds of harassing attacks at any point during the trip were high. Raphael busied himself providing various skill enhancements to the sailors aboard the Salty Jerky while Marty used his oratorical talents to do the same aboard the Lissifea. Kevin didn’t bother. Thralls already had plenty of enhancements, and throwing spells over and over and over again to give them minor boosts just wasn’t something that could hold his attention. Towards the evening Raphael was the first to notice a selection of barrels, planks of wood, and crates floating by in the water as they sailed along. Raphael promptly divined that there was a large concentration to the northeast – and several smaller concentrations scattered around the large one – information which he promptly broadcast. While Marty was suspicious – those floating things could be traps or be serving as supply depots for the Otters aquatic allies – the Thralls in the sea easily determined that the stuff had no nets, or mines, or other booby traps with it. It simply seemed to be wreckage and lost cargo. There was… barrels of sugar and flour, a crate full of silks, a plank of wood badly cracked and splintered, and a barrel of rum. The dolphin-form Thralls reported the sound of wood grinding on stone and the crash of waves. The shark-form Thrals reported the smell of death and blood. Kevin thought that that DEFINITELY sounded like debris from a destroyed ship (or perhaps someone trying to simulate such, although that seemed pretty unlikely). He dispatched a contingent of Thralls to gather stuff up and hunt for survivors while Raphael and Marty collected floating stuff a bit more directly. It… looked like a ship had hit a coral reef. Judging from the damage, they’d either hit it very hard indeed or something really weird had happened; the ship had been broken in two. The rear of the ship had broken off and sunk to the bottom, while the forward section was laying on it’s side on top of the reef. The Thralls reported three survivors tucked in an air pocket in the aft section currently unconscious from depleted oxygen, and five survivors on the fore section huddled on top of the exposed sections of the ship. Rescue operations were underway – along with some secondary investigations. The survivors were quite pleased – and very surprised – to be seeing rescuers. They hadn’t thought that anyone would be coming in this direction. (Survivor) The Captain was taking us through the reefs towards a cove he knew was in the area. He said he had done this hundreds of times, so we trusted him to know what he was doing. While we were quietly threading the reefs, the sails suddenly went full as a massive wind came out of nowhere driving the ship forward hard. We were trying to drop the sails before we hit something when James said the anchor was dropped. There was a massive scramble to cut the rope when it went taunt and the ship swung hard into the reef. There was a lot of cracking of wood and flying debris and I lost consciousness. Next thing I knew I was upside down on the main mast as it angled into the water. Huh. That certainly sounded like a lot of power invested in taking out some small time traders who ran up and down the coast. A wind burst and a bit of TK could do that easily – and produce a quick wreck. Was it because their ship had beaten the main convoy to the area and been taken as an outrider? Marty was enthused! Aha! So they WERE penguin pirates! (Kevin) “Would they like to come along with our expedition? (Kevin) “Well, really yes; catch the pirates is one of our goals… Most of the convoy, however, are simply merchant ships who will be leaving dealing with the “pirates” up to the rest of us. We have a bet with a rather dishonest Otter clan who are using “pirates” to maintain their trade monopoly. Still, it’s quite possible that they’ve opted out; the bet and monopoly may not be worth what it would cost them to try to maintain it. There was some internal discussion among the survivors, but they eventually settled into coming along on the expedition. The head officer asked if they would consider their service payment for the rescue. Kevin assured them that they could expect a basic share – especially since they’d be providing extra transport room and whatever was left of their own trade goods – and pointed them to the Platypuses for the route.